Gross Area: 34,250 sq. ft.
Area Per Student: 28.17 sq. ft.
Wilson College is a private Liberal Arts College located in Chambersburg Pennsylvania. Their original historic 1923 Gothic library, constructed of natural limestone and terracotta block masonry, forms the College Green’s northern edge. The attached 1960’s Annex was a mundane structure built for the Collections Repository, which faced the north parking lot. The building was closed in early 2011 due to mechanical infrastructure problems rendering it unfit for occupancy. This provided an opportunity to revisit its functionality and how it serves today’s student. 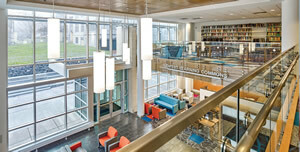 The library needed to become a new and vibrant designation center that connected to the rest of the campus. Sensible Flexibility was the main design principal that emerged to allow students to learn and socialize in varied environments. The programming required appropriate access to services by utilizing flexible zones for support, computing, collections and classrooms while maintaining a division of staff and public spaces. 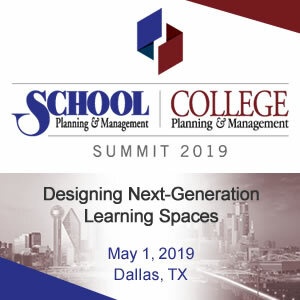 The Study vetted six conceptual options until a consensus scheme arose to raze the Annex, build a new 14,473 square-foot Learning Commons, and create a multipurpose student outdoor plaza for educational and social activities. The College had already begun the process of reducing physical volumes of serial collections through perpetual electronic access. The Collections were eventually reduced from nearly 200,000 volumes to just over 102,000 volumes. The stacks were removed to create space for the new programming. 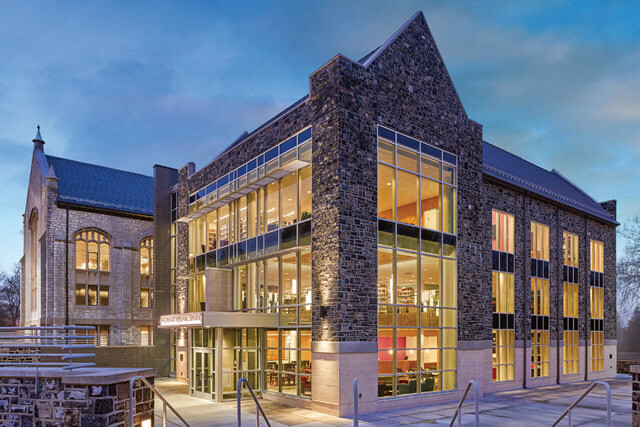 The new building was designed respectfully sensitive to the surrounding historic structure for the Academic Quad. The existing parking and access road were removed for the outdoor amphitheater to support learning and campus events. New pedestrian/circulation paths support the college’s desire to make this building the heart of the academic experience. The Learning Commons’ floors were offset to achieve increased floor height on the Lower and Upper Floors. 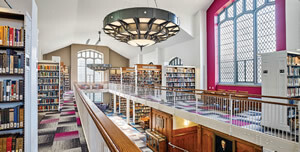 The new Learning Commons’ lower floor was sited 30 inches lower than the 1923 Library, increasing the volume that supports the public spaces for lectures and social gatherings. 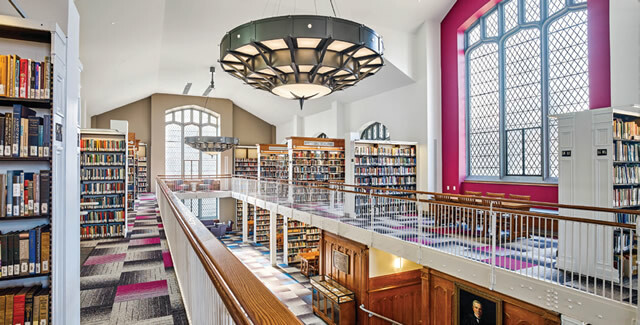 This design strategy also aligned the Main Floor with the original Library. The Upper Floor is 24 inches higher to achieve a higher ceiling for the Art Gallery and open study areas. The exterior wall of the original library was restored and incorporated into the interior passages of the new Learning Commons. Wood paneling wainscot incorporates the 30-inch change in elevation between the buildings on the Lower Floor. This connection of the two buildings created a wonderful richness to the space and a unique new ground floor student entrance on the West Facade. The exterior of this building is lovely. They did a nice job of blending the new building with the historic structure. 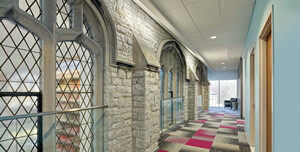 Nice use of exterior wall of original library as an interior passage.